Arlene Mendoza-Moran plays disc golf at the 2018 DELTA Staff Picnic. Since its creation in 2000, DELTA has focused on the wellbeing of its staff members with activities like an annual Thanksgiving potluck to staff picnics with games and activities. This summer, DELTA was recognized as a gold Well Wolfpack Certified Organization for its efforts in creating an active workplace and culture of wellness. 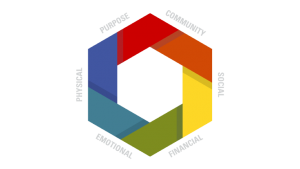 In line with the university-wide Wolfpack Wellness initiative, the wellness programs at DELTA focus on a combination of six elements of wellness: purpose, financial, community, physical, emotional and social. “Since joining the campus wellness initiative, we are inspired to create wellness activities that promote adopting and maintaining healthy behaviors, collaboration and productivity, all while having fun,” said Human Resources Consultant Alexis Simison. Simison kicked off an official wellness program at DELTA in April 2018 to improve the lives of employees and help drive the success of the organization. Administrative Support Specialist Tammy Rodda coordinates monthly lunch and learns with presenters from inside DELTA and across the university and community. A few of the topics have included plant-based lifestyles, public speaking tips and conflict leadership. DELTA also offers other wellness activities such as a bi-weekly disc golf group, weekly lunchtime yoga sessions and stretching exercises. Rodda and Simison manage a whiteboard in the DELTA office spaces to post upcoming wellness activities, tips for living a more active lifestyle, healthy eating tips and more. According to Assistant Vice Provost of Business Operations Jessie Sova, the benefits of having regularly scheduled wellness activities for DELTA staff include greater productivity, reductions in work-related injuries and creating a healthier work environment. 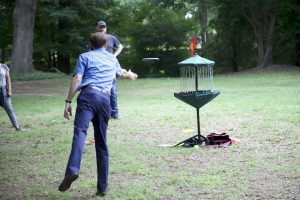 David Howard plays disc golf at the 2018 DELTA Staff Picnic. DELTA is just getting started on its wellness program initiatives. A variety of lunch and learns are planned for the coming months on topics such as time management, career development and mindfulness. Other planned wellness activities include sessions on clogging, Tai Chi and a step/stair challenge. A new Wellness Committee is being assembled to assist in planning, promoting, and implementing different wellness programs as well as communicate, participate, motivate and support DELTA’s wellness initiative. “The core of every good wellness program is behavior change. Providing the motivation, skills and tools and social support enables people to create real change,” said Simison. Do you have an idea for a wellness activity or lunch and learn topic? Interested in joining the DELTA Wellness Committee? Fill out this Google Form and Tammy Rodda and/or Alexis Simison will be in contact with you! For more information, visit our Wolfpack Wellness Initiative webpage. View a schedule of our wellness events.